and in my little corner of Ghana, cast a shadow that there is ‘something out there’ – with awareness growing from essentially nothing to cautious apprehension. The list reads more like a spy novel plot than the machinations of a cureless virus. Infections and fatalities continue to rise steadily. x axis is days since March 23. 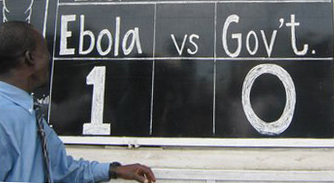 Developments have been mixed, but it seems fair to say that the Ebola is still winning. In the last 21 days, 435 new infections and 190 new deaths have been reported. These statistics would look a lot better in not for a horror week from 22 July, in which 230 new infections and 69 deaths were reported. 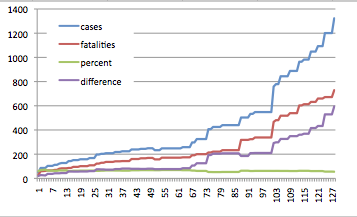 The fatality rate has dropped from 60% to 55%, but the long term trend indicates a 60% fatality rate. The disease remains focused on three countries, Guinea, Sierra Leone and Liberia. Nigeria, the fourth country with a recorded infection, was not unlucky to join the club – it reaped the odious reward for appallingly substandard screening in Liberia, setting up a macabre experiment to see how the disease responds to a new host country and how the host country responds to the new disease. Somewhere in Liberia – someone has either kept their sense of humour or understands how to communicate a message effectively. Guinea looked like it was getting on top of things, reporting only 14 new infections and 16 deaths from 1 to 24 July. However the final numbers for the month were 47 infections and 36 deaths, suggesting either lapses in containment that the disease has taken cruel advantage of, or an example of underground transmission – where people are not reporting cases because of the perception that sick people go into the clinics and don’t come out – skewing the recorded data. Senegal has done well. Ebola has failed to spread there. The disease entered the media in mid-March and on 31 March Senegal closed its land borders with Guinea, and possibly save itself from a similar fate. Liberia, although struggling, has introduced a raft of measures – cancelling public events, closing schools, quarantining entire areas, mobilizing the army and sending public servants home on forced leave. The blot on Liberias copy book is the decision to start screening passengers at its airport after Patrick Sawyer boarded a plane with a fever following his sisters death from Ebola. If sensible practices and procedures can’t be emplaced and enforced in a highly controlled environment like an airport, you can only imagine the difficulties faced working in remote rural areas. Sierra Leone, which has the dubious honour of boasting half of all the reported new infections (286) and deaths (185) for the month of July, declared a state of emergency on Wednesday. Prior to this, proactive action in Sierra Leone was obvious by its absence (in the media at least). The disease has made it to the capital, Freetown, and not even Hollywood could dream up the ‘kidnapping’ of a known Ebola carrier from isolation in hospital by her parents in the capital, triggering a two-day manhunt, and a graphic example that some people still don’t believe Ebola is real. Nigeria, despite the same funding, social and traditional hurdles faced by other countries has, by some accounts responded well to a potential disaster. But there is plenty of evidence that what is said does not always match the reality (see Ghana below). Nigeria was very lucky that the victim collapsed in the airport and spent no time roaming freely in Lagos before succumbing to the disease. Five days through the 21day incubation cycle there are no reported additional infections. Just to add to the mix, the plane stopped in Accra, Ghana and Lome, Togo, before arriving in Nigeria. On Patrick Sawyer, the American who flew to Lagos with the disease. He probably knew he was getting sick. Reports say he had not been in the US for almost a year. I fully empathise with how he reached the decision to get on the plane rather than go to hospital – the desire to go home at the end of a field swing is extremely strong – magnified if you’re sick. He probably simply wanted to be at home, with his family. Holding a foreign passport and working for the government probably helped cut a few corners as he went through the process to board the plane. He clearly came in contact, either directly or indirectly with the body of his dead sister. Lapses at every level in Liberia brought Ebola to the doorstep of a city with a population of 21 million. Statements that screening and security is in place at airports and border crossings are later revealed to be fictitious by journalists, then preparedness as ‘a bit on the low side’ by Ghana Immigration Services, with 4 of 42 entry points equipped to deal with possible carriers. An injection of capital reported to have been fast-tracked to health services has failed to materialized in the health system coffers. Health professionals have declared a general level of under-preparedness, with a comic-tragic(?) example of a Liberian in-patient with a fever being deserted in the ward by fleeing doctors. The doctors are adamant that, as they are not supplied with the required protective equipment, they have no intention to hang around. In fact, they’ve made it clear that they’re prepared to run away again and I’m not sure I blame them. A news article states that Ghana has closed all its flights to infected countries, resulting in bewilderment from the supposedly affected countries. Ghana is already dealing with an infectious disease outbreak, cholera has been reported in Accra since September 2013, frustrating attempts to bring it under control. I can only hope that it all comes together in the end – and that Ghana has its systems in place if they’re required. But systems and response is only half the battle. A population who believes that the disease is real, and understands the required changes to how people interact with each other and the deceased, and believe in the processes to isolate infections, can beat the disease – its been demonstrated in every previous Ebola outbreak. 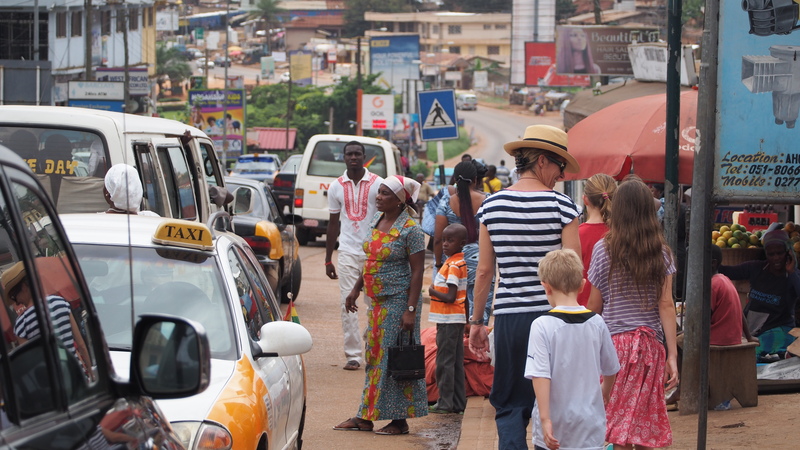 The community here is slowly becoming aware of Ebola. The continuing scare in Nigeria has been a significant factor. 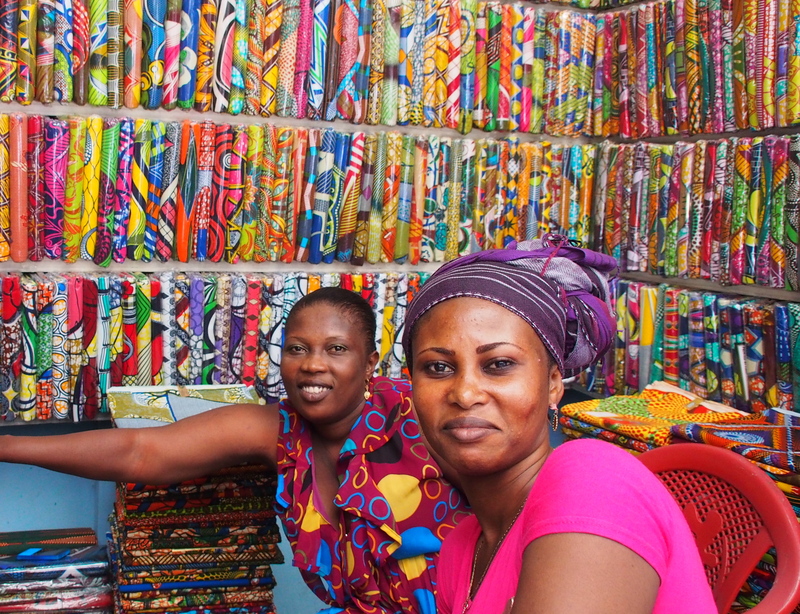 Ghana, despite healthy rivalry with Nigeria, has strong ties. “They say there is a terrible disease with no cure…” from the cleaner is the start to a conversation which has to be constantly drawn away from a slightly xenophobic perspective. There is genuine disbelief that a bat can carry Ebola but show no signs of illness. Ebola comes up in meetings. It comes up in conversations. For a country that habitually shakes hands, I’ve noticed a few instances of this protocol being shelved. I hope that this golden opportunity to educate an increasingly enlightened community is not wasted – it could make all the difference if Ebola does enter Ghana. Comments to the news report above are an interesting insight into what people are thinking (Diarrhea and fever are early symptoms – fever-pitched verbal diarrhea needs to be added to the list). Denial, anger, fear, etc all feature. I remain confused that a disease that is generally stated to be difficult to spread (needing contact with fluids of the infected patient) continues to infect highly trained health professionals – including some very experienced doctors (Kent Bradley, Nancy Writebol remain ill, and Ebola researcher Sheik Umar Khan died, one of the 60 healthcare fatalities to date)). I doubt there is any room at all for laissez-faire attitudes in these environments. If people with such strong understanding of disease control and prevention have been compromised, perhaps we shouldn’t be surprised that the general population have struggled. Does it suggest that Ebola is not as difficult to transmit as we want to believe? Apparently Ebola does ahve the potential to be aerosolized (researchers got monkeys to transmit it to each other without contact (how do you get that job?)). From the same document, there is a ‘strong suspicion’ that airborne human to human transmission occurs. This is, however, largely dismissed by the WHO, as recently as yesterday (1 August). Articles constantly remind me that Ebola remains infectious on a corpse, but can it survive away from a living host? If so, how? And for how long? And how much is required to re-infect? A little bit of digging shows that the virus can survive, and retain its potency, in fluids and ‘matter’, wet or dried out, for ‘several’ days, and that only 1-10 organisms are required to infect someone – that doesn’t sound like very many. There has not been a lot of good news through the month. People are definitely being woken up to the fact that Ebola is real (it’s getting pretty hard to ignore). This may go a long way to curbing infection rates because of disbelief or poor education about the disease. Two of the affected countries have put clear systems in place to better organize disease control, which, in theory should also help. It’d be nice to end this post with some cheerier news, like an imminent vaccine trial, so I will – reported to start as early as September!